ftwPortal Pro offers secure two-way access by plan sponsors and other related parties to plan documents, forms and other secure data, enabling your clients to view, print, save and e-sign documents in a secure environment. The portal is seamlessly integrated with the ftwilliam.com suite of Document, Government Forms and Defined Contribution Administration software applications. web-portal for clients to review. Post Amendments. Batch prepare your amendments and then post them to the web-portal for clients to review. E-sign plan amendments. Clients can e-sign plan amendments via the web- portal just like 5500s. Batch Processing for notices, reminders, amendments. Clients may batch process notices and amendments as well as batch post them to the web- portal for clients. Selective distribution of miscellaneous announcements, newsletters and other documents. This feature allows customers to securely transfer miscellaneous documents via our web-portal. To Do List. 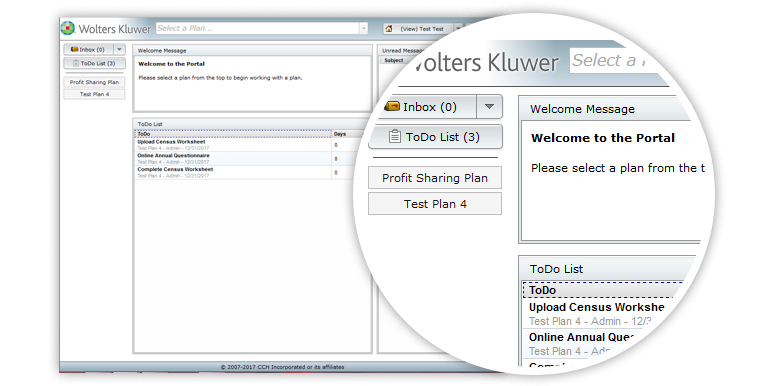 Notify your clients through automatic reminder emails and a “To Do” list when the client signs into the portal. Status Grids. We provide you with information regarding the status of each of your client’s tasks (such as e-signing their amendments and downloading their notices). Portal Branding. Brand the portal with your company colors, logos, text etc. Secure transfer of data. Securely transfer census data and the annual questionnaire via our portal. 3rd Party Access. If anyone other than your main contact or signer needs access to a document, you may create additional portal users for this purpose (ex. Lawyer, accountant, financial planner). Message Manager. Just like email, you can securely send messages to your clients and also receive messages via the portal. File Manager. Send documents related to a specific plan to any portal user associated with that plan. Batch Invitations. Once all portal users are prepared, send a batch invitation to everyone with a couple of clicks. Unlimited portal users and customizable access. Clients may have unlimited portal users as well as customize what type of access each will have (i.e. editing rights, view only permissions, and which module they will have access to).